As the world comes to understand the importance of stabilizing our changing climate, the role of nuclear power will become more and more important. Like solar power, a nuclear power plant emits zero greenhouse gas while generating electricity. But when the life-cycle of a generator is taken into account, nuclear emerges as the cleaner option. A life-cycle analysis counts emissions from cradle to grave – from the first actions taken to build a power plant to the last actions taken to dismantle it. Building a nuclear power plant, or building a solar plant, both require energy that comes from carbon-based fossil fuels. These fuels come back into the picture when a plant closes and is dismantled. As the Intergovernmental Panel on Climate Change has confirmed, nuclear energy emits less greenhouse gases than solar power does for any given unit of electricity produced. Source: Intergovernmental Panel on Climate Change, Special Report on Renewable Energy and Climate Change Mitigation, 2011. When a country uses nuclear power, it doesn’t need as much power from coal, oil, or gas. These fossil fuels release greenhouse gases, such as carbon dioxide (CO2), that contribute to climate change. According to a 2013 paper by Pushker Kharecha and James Hansen of the NASA Goddard Institute for Space Studies and Columbia University Earth Institute, nuclear power prevented the release of 64 billion tonnes of greenhouse gases between 1971 and 2009. Fossil fuels emit sulphur oxides and nitrogen oxides – pollutants that worsen respiratory illness and cause deaths. Kharecha and Hansen found that nuclear energy, in displacing fossil-fuelled electrical generation, prevented 1.84 million air pollution-related deaths between 1971 and 2009. In 2003, Ontario began to replace its coal-fired plants, completing the switchover in 2014. To make up the difference, Ontario ramped up nuclear power generation, from 37% in 2000 to 62% in 2014. Over that time, air quality improved significantly: the provincial government reports that air quality is good 90% of the time. 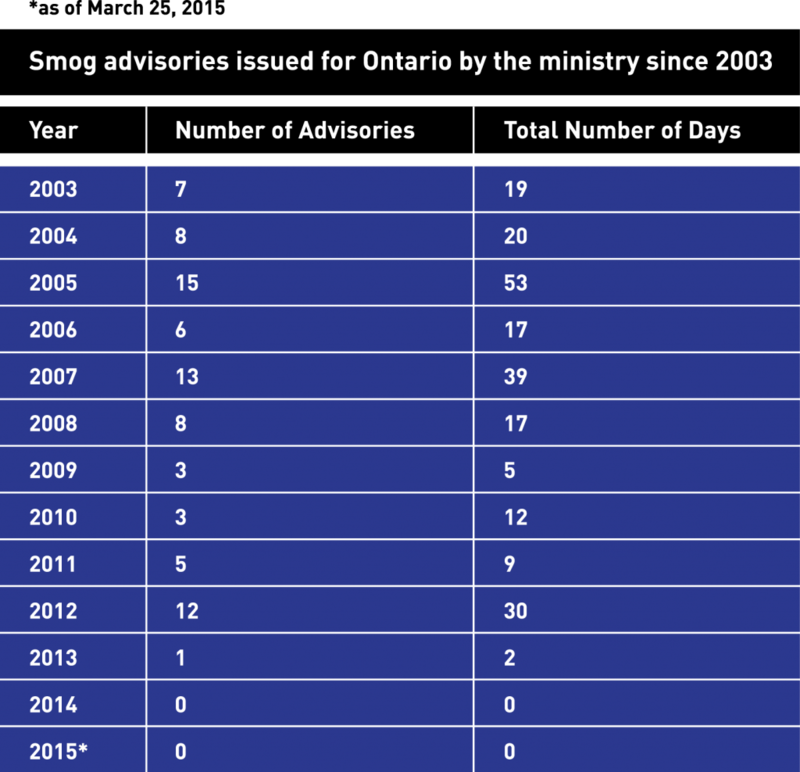 With a few exceptions, the number and duration of smog advisories across the province has dropped steadily since 2003. Cleaner air means better health. Toronto’s health department reports that premature deaths attributed to air pollution dropped from 1,700 to 1,300 between 2004 and 2014, while hospitalizations fell from 6,000 to 3,550. Kharecha and Hansen also use their research to look ahead, and find that nuclear power could additionally prevent anywhere from 400,000 to seven million deaths by mid-century, depending which fuels it replaces.